Prepare to fall in love with layer cakes all over again. If your coconut water does not measure 1 cup (8 fluid ounces), add enough tap water so the liquid measures 1 cup. Even though fresh coconut is sublime, you can use Goya brand coconut water in place of fresh coconut water and buy coconut flakes in the baking aisle. To prepare the cake, preheat oven to 350°. Lightly coat 3 (9-inch) round cake pans with cooking spray; line bottom of pans with wax paper. Lightly coat wax paper with cooking spray; dust pans with 1 tablespoon flour. [post_ads]Combine 12 ounces (about 3 cups) flour, baking powder, and salt; stir with a whisk. Place 1 1/2 cups plus 2 tablespoons sugar and butter in a large bowl; beat with a mixer at medium speed for 2 1/2 minutes or until well blended. Add flour mixture and coconut water alternately to sugar mixture, beginning and ending with flour mixture. Beat in 1 teaspoon vanilla. In a separate bowl, beat 6 egg whites on high speed until foamy using clean, dry beaters. Add remaining 2 tablespoons sugar, 1 tablespoon at a time, beating until stiff peaks form (do not overbeat). Carefully fold egg whites into batter; pour batter into prepared pans. Bake at 350° for 18 minutes or until a wooden pick inserted in center comes out clean. Cool in pans 10 minutes on wire racks; remove from pans. Discard wax paper. Cool completely on wire racks. To prepare frosting, combine 4 egg whites, cream of tartar, and 1/8 teaspoon salt in a large bowl; beat with a mixer at high speed until foamy. Add 2 tablespoons sugar, 1 tablespoon at a time, beating until stiff peaks form. Combine remaining 1 1/4 cups sugar and 1/4 cup water in a saucepan; bring to a boil. Cook, without stirring, until candy thermometer registers 250°. With mixer on low speed, pour hot sugar syrup in a thin stream over egg whites. Gradually increase speed to high; beat 8 minutes or until thick and cool. Stir in 1 teaspoon vanilla. Place 1 cake layer on a serving plate, and spread with 1 cup frosting. Top with another cake layer. Repeat procedure with 1 cup frosting and remaining cake layer, ending with cake layer on top. Spread remaining frosting over top and sides of cake. 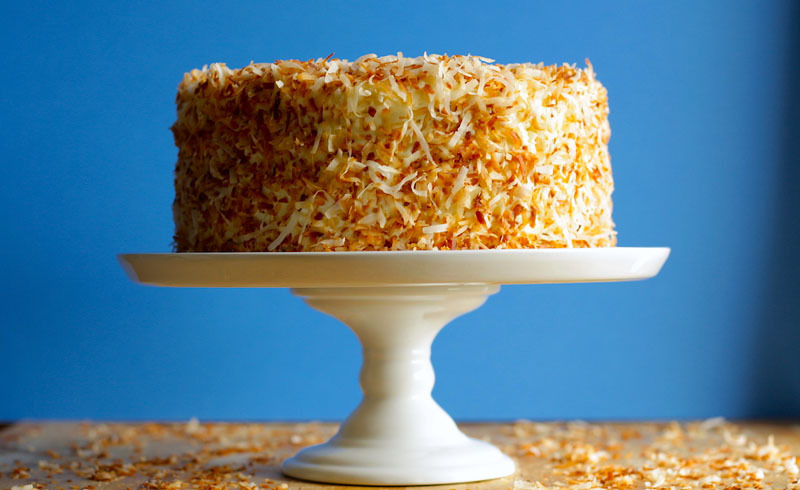 Gently press shaved coconut onto top and sides of cake. Store cake loosely covered in refrigerator.